NEW RIVER VALLEY– Hospitality—and Hokie football—isn’t simply a pastime in the New River Valley, it’s a way of life. It comes as no surprise, then, that Southern Living ranked Virginia Tech’s tailgates as eleventh best in the South. Blacksburg’s tailgating atmosphere embodies the New River Valley, a region defined by welcoming and inclusive small towns. In fact, in 2016, Virginia Tech and Blacksburg were ranked #6 for having great town-gown relations by the Princeton Review in response to their annual survey which asked students whether they got along with their local community. 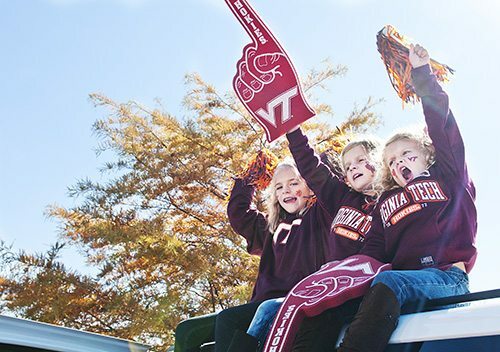 At a Tech tailgate, meandering between parking lots and making new friends is the name of the game—and, as any Hokie fan will tell you, it’s this good-natured spirit of the sport that brings everyone together, from college Freshmen to local retirees. In 2016, Bleacher Report ranked Lane Stadium and its atmosphere as the #20 College Football Stadium in America, and, that same year, USA Today called it a “hidden gem” with “one of the best team entrances in sports” when it ranked the Hokie experience as #10 in the nation. While it may be true that Hokie fans bleed orange and maroon, their enthusiasm for creating a warm and friendly game-day experience is what sets Tech fans apart from the crowd. To read more about how Virginia Tech stacked up against the competition, visit Southern Living’s article on The South’s Best Tailgates 2017.